It’s not a hoax. It’s not an imaginary story. It’s not a dream. We’re getting a Shazam! movie. 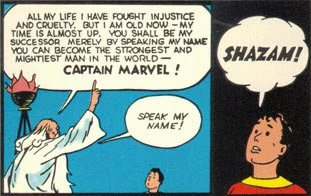 And it’s made official not by casting Zachary Levi as the hero formerly known as Captain Marvel, nor by circling around Mark Strong as the evil Dr. Sivana, but by remembering that what sets this apart from other superhero movies is a boy. A good-hearted young orphan selected by the ancient wizard Shazam for his purity of heart and willingness to do good: Billy Batson. Variety reports that New Line Cinema has cast Asher Angel of Disney Channel’s Andi Mack in this crucial role. When he speaks the magic word “Shazam!” he transforms into Zachary Levi. It could happen. Although there has been a lot of talk of a separate Black Adam film, Dwayne Johnson has been strangely quiet, and to be fair, if he runs for President, being an antihero might not be the best thing for his image after all. But though this film sits over at the Warner Brothers’ subsidiary New Line Cinema, it still gets talked about as being in the main DC Cinematic Universe, being developed on the slate alongside Batgirl and Suicide Squad 2. Maybe DC Films just wants to keep a separate “fun” slate of movies. Not that I’m suggesting that about Suicide Squad 2. Production begins in February 2018 for release sometime in 2019.